ASH25EB28 self launching open class twoseater with 28 meters of wingspan and a multitude of additional detail solutions. Sufficient space even fort tall pilots in a spacious cockpit under a one piece canopy. The elongated fuselage built up from carbonfibre and Kevlar reeinforced plastic is subjected to vacuum driven surplus resin removal for weight optimization. The gross weight is 810 kg. Gain of Performance through boundary layer control – speed controlled blow turbulator in slow flight and turbulator tape for high speed. For larger battery capacity NiCads can replace the compensation led in the outer wing, which saves additional weight. A longer nose cone and wider cockpit provide for more seating comfort and ampel space even for tall pilots. For more passive safety the seating pan is made from carbon-kevlar-fibre hybrid material. The ruder with the new central hinge serves for less effort and thus higher control comfort during flight. The hydraulic disc brake on the retractable gear is connected to the speed brake lever fully applied. Cockpit ventilation through air intake at the fuselage nose. 6-part cantilever wing with laminar airfoil and dual boundary layer control on lower wing surface. 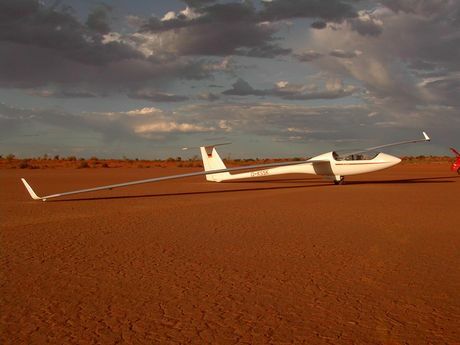 The HQ17 airfoil is used throughout the whole 28 meter long wing from tip to tip. Fuel bags can be installed into each inner wing. All control surfaces are made from high modulus carbon fibre providing an extra stiff and light weight system. Metal dive brakes covered by flexible fibre top come out of the upper wing surface. Push rods guides are sealed by rubber bellows. Removable carbon design contour seats with built in cavity for a parachute. One piece perspex canopy for improved pilots visibility equipped with three sliding windows. The two rear sliding windows allow for applying bug wipers from the rear seat. Defogging ventilation for the canopy. Individually controllable air outlets for each pilot on the right cockpit wall. Continuously adjustable quick trimming adjuster– adjustment lever on the controlsticks. Front seat ruderpedals adjustable in flight. Tost safety release for aircarft towing. Radio antenna built in to vertical fin for optimal radio performance. Wing extensions with wheels and wheel fairings for improved ground handling. Fuel bags with 19 ltr capacity each in both inner wings plus a 8 ltr plastic tank in the fuselage. Solo engine 2625/2 with 625 cc , ca 62 hp and dual ignition. Centrifugal sliding clutch in toothed belt drive for smoother running comes as standard equipment. Electric power supply by two lead batteries, one in each inner wing. Already during construction of the fuselage shells about 10 kg of resin weight is saved by taking out surplus resin by vacuum sucking. Additional 5 kg can be saved by using lithium-mangan-batteries in the fuselage instead of lead batteries in the inner wings. Optimization of aerodynamic performance by boundary layer control both during slow and high speed flight. An air duct is built into each wing. Air coming from a NACA intake on the side of the fuselage is guided by the air duct and blown out through small boreholes along the wingspan not far forward of the control surface gaps at slow speeds. For higher speeds the airflow is blocked off. The so called laminar bubble is then eliminated by a turbulator-tape.